Tropical Blends of Pineapple and Mango meet Your favorite energy drink in this All Day Vape from Vapester E-Juice. I appreciate the simplicity of the labeling. Vapester E-juice decided to stray away from the any silly characters or catchy flavor names, choosing instead to focus on a nice, professional logo design. This mouthwatering tropical citrus is reminiscent of your favorite energy drink. I’m not sure what your energy drink of choice is, but Vapester definitely had characteristics of a few brands I’ve tried including: Rockstar tropical blends, and some base flavors of a Red Bull (without the unique anise taste). If I had to point out the primary tropical note in the liquid off smell alone, I’d guess either mango or pineapple. Single 2.5mm (ID) Alien Clapton (.18ohms per/coil) from Saddlehorseblues on the deck of the Geekvape Tsunami 24mm RDA. Pulsed on the Titan Mods V2 parallel (overkill, I know. Were talking .5 second drags max…). Airflow cut down about 25%, seems to be a great combination for stellar flavor production on this RDA. Front – I noticed tropical flavors right off the bat. Pineapple and mango play a big role here, with some subtle hints of papaya. The energy drink base was not quite as noticeable as I expected it to be. Middle – After the tropical fruit flavors have been established, some of the characteristics of the energy drink start to peek through. The acidity was missing from the scene, and this actually threw me off a bit. I’d lean towards a more low-key Rockstar or Monster base at this point. End – The tropical energy drink flavors are at their strongest here. Nothing overwhelming, but really really good. All tropical fruit flavors take a back seat, and dissipate towards the end. Aftertaste – Super clean. I was actually quite impressed! Any energy drink liquid runs the risk of becoming a syrupy, sugary mess. Thankfully, my palate was left clean after each vape. Vapester is a Max VG eliquid so you can expect the clouds to be pretty aggressive. Even with my single coil setup, I filled my entire basement with dense vapor after 10 minutes of vaping. If you’ve been looking for that perfect energy drink vape, you may just want to give this one a try. The mix of tropical flavors really take this liquid to another level. 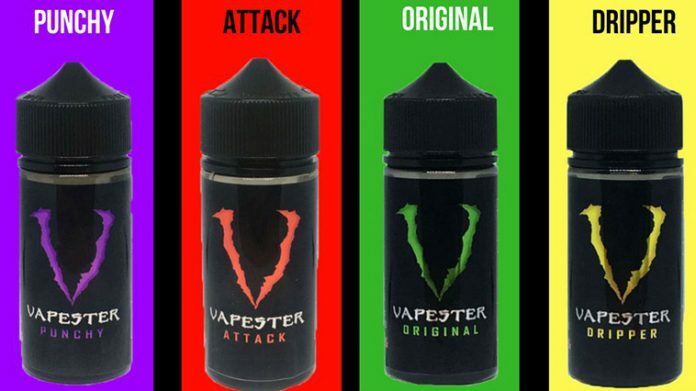 Instead of trying to duplicate the taste of a single energy drink, Vapester decided to blend the best flavors of multiple drinks together in one bottle!